Many cineastes consider The Freshman (1925) to be silent comedian Harold Lloyd’s undisputed masterpiece. It was the pinnacle of his “Glasses Character,” a bespectacled protagonist that left home to succeed out in the world. 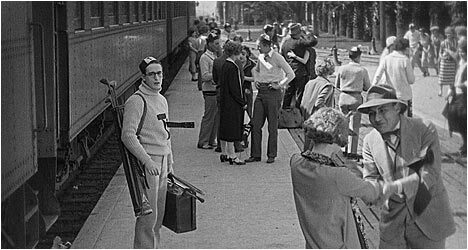 In the case of this film, Lloyd is Harold Lamb, the eponymous freshman who desires to become the most popular student on his college campus. However, in typical Lloyd fashion, his character’s aspirations overshadow his ability to achieve them. By bestowing glasses on his characters, Lloyd gave them an everyman quality that endeared him to audiences and that propelled The Freshman to box office glory. Harold comes off as a bit bookish and this only reinforces his resolve to prove his physical prowess to everyone. He is mocked and ridiculed by his classmates, which only makes us root for him more. We want to see him best the snooty Joe College types that think they are better than him. An expert in constructing comedic set pieces, Lloyd starts off small, gradually building towards the climactic football game where, against all odds, Harold displays fantastic athletic ability through tenacity and sheer force of will. Lloyd pulls out all the stops with one incredible visual gag and physical stunt after another. Over the course of The Freshman, Harold meets a beautiful girl named Peggy (Ralston) whom he tries to impress, but only manages to comically embarrass himself. She provides additional motivation for him to succeed. Lloyd’s protagonist is the perennial underdog – the underrated guy who never gives up. This can-do attitude embodies the American spirit and made him very popular with audiences at the time. The Blu-Ray transfer is a thing of beauty with incredible detail that is crisp and sharp. The Freshman has never looked better. There is an audio commentary by film historian Richard Bann, film archivist Richard Correll and film critic Leonard Maltin. They point out that Lloyd had wanted to make a football movie for some time. They draw our attention to key cast members and provide brief insight into their identities. This is quite an entertaining and informative track with plenty of factoids and analysis. “Harold Lloyd’s Funny Side of Life” is a theatrical program that Lloyd created in 1966 featuring a highlight reel of his films along with The Freshman. He also recorded an introduction where he reminisces about the era in which these films were made in. Also included are three newly restored short films: “The Marathon,” which saw Lloyd impressing a girl by running a local marathon; “An Eastern Westerner,” a hilarious parody of westerns; and “High and Dizzy,” which saw Lloyd playing a doctor who helps a sleepwalking female patient. Film historian Kevin Brownlow and Lloyd archivist Richard Correll talk about Lloyd’s career and The Freshman in particular. Correll talks about how he became a fan of Lloyd’s films and recounts the time when he first met the man. “Harold Lloyd: Big Man on Campus” is a visual essay by John Bengtson, author of Silent Visions: Discovering Early Hollywood and New York Through the Films of Harold Lloyd. He takes a look at the locations used in the film. This extra uncovers the origins of The Freshman before taking us on a tour of the locations used. This is a very informative extra that includes stills of deleted scenes. “Delta Kappa Alpha Tribute” is an excerpt from a 1963 tribute to Lloyd and Mary Pickford at the University of Southern California’s School of Cinematic Arts with Steve Allen and Jack Lemmon in attendance, asking Lloyd questions about his life and career. Finally, there is “What’s My Line?” To promote the theatrical re-release of The Freshman, Lloyd appeared as a “mystery guest” on the popular CBS television show What’s My Line? in 1953.